Watch these video demonstrations to see how the data was obtained. You'll not only see the method used, but you can also get an understanding of some of the errors inherent in obtaining data. These clips last a total of about 15 minutes. In shorthand notation, vav= Δd/Δt, where vav represents the average speed, Δd is the distance traveled, and Δt is the time to travel that distance. The Greek letter, Δ (uppercase delta), is commonly used to represent the difference of initial and final values of a quantity. Therefore, Δd means df - di, where di is the initial distance (frequently 0) and df is the final distance. Note that one always subtracts the initial value from the final value. Likewise, Δt = tf - ti. It's important to remember that average speed is the ratio of two differences. A common way to determine the average speed of an object is simply to measure how long it takes the object to travel a known distance. This is called a time-of-flight technique. Sound waves are known to travel at a speed of about 340 m/s in dry air at room temperature (20 °C). This speed is generally too fast to measure accurately by time-of-flight techniques. 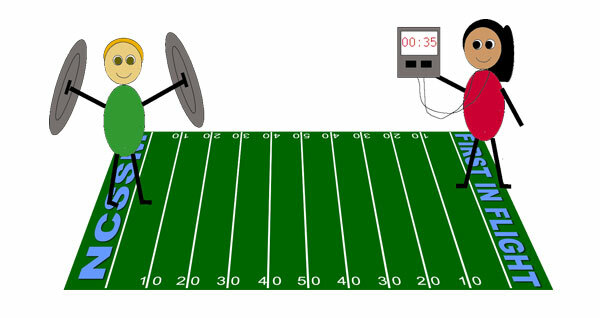 In one method, students stand on the goal lines at opposite ends of a football field. At one end, a student smashes two metal trash can lids together. At the other end, another student starts a stop watch when he/she sees the lids come together. (See below.) He/she then stops the watch upon hearing the sound from the lids. The time interval between sight and sound is only about a third of a second. This isn't much longer than a typical human's reaction time in starting and stopping the watch. Therefore, accurate results can't be expected with this method. The method used to collect data for the present experiment is described in the video clip Measuring the Speed of Sound Part I. Two wood blocks are struck together to produce a loud sound. The sound is detected by two microphones a distance d apart. Each microphone is connected to an amplifier which automatically discharges a flash unit. The flashes of light illuminate a disc rotating at a constant frequency. 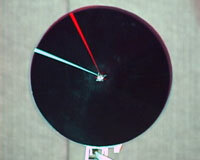 The disk, which serves as a clock to measure the time interval between the flashes, is black except for a white radial which serves as the hand of the clock. The two flashes of light produce two images of the hand separated by an angle. A typical photograph of the clock face is shown to the right. These photos are frame captures from the video. The photos can be used for analysis. There are two sets: Set 1 / Set 2. On the photos, measure angles between the images of the clock hand. Calculate the corresponding time intervals using the given information that the frequency of the clock disc was 50.0 Hz. Plot a graph of the distance between microphones (given on the photos) vs. the time intervals. Find the slope of the graph to determine the speed of sound. Here's a follow up video.